The Ballad of Black Tom opens with a dedication, “For H.P. Lovecraft, with all my conflicted feelings,” which is a handy summary of how many, if not most, modern readers feel about Lovecraft. Victor LaValle has written at some length elsewhere about his history with Lovecraft’s work and how he was inspired to write this novella in response to the Lovecraft story “The Horror at Red Hook,” so I won’t rehash that all here. 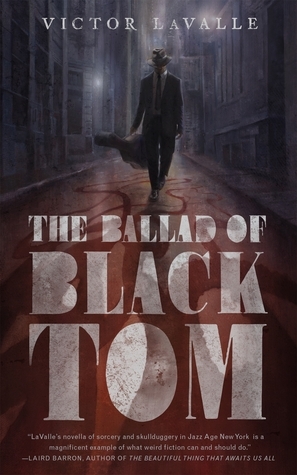 Suffice it to say that The Ballad of Black Tom functions as both an indictment of and a love letter to Lovecraft, but it’s also a great story in its own right and is sure to be one of the best novella-length works of 2016. It also doesn’t actually require a familiarity with the material that inspired it, although it does help. Even just a basic knowledge of Lovecraft’s work and his major themes will enrich your reading of LaValle’s novella and place The Ballad of Black Tom in proper context. While there’s definitely a vast difference in the length of Black Tom and the short story that inspired it, the biggest difference here is one of narrative scope. LaValle brings Tommy Tester and his contemporaries to life in a way that is directly contrary to Lovecraft’s fantasy of immigrant communities as unwashed, faceless hordes to be controlled and exploited by one malevolently erudite old white dude. Victor LaValle has done his research and combined it with his own lived reality in order to resurrect for the reader a specific time and place and people, and “The Horror at Red Hook”, in comparison, ends up looking like exactly what it is—the paranoid imaginings of a very sheltered, racist white man. Whereas Lovecraft viewed immigrants and brown people with the same degree of horror with which we might think of tentacle monster gods in the depths of the ocean, LaValle is consistently clear on what the horrors are in Black Tom. At the same time, though, LaValle eschews any simple dichotomy of good and evil, instead preferring to explore ideas about how and why evil is made and used—and what it means when different people use it. When the climax of The Ballad of Black Tom comes, it’s a scene of catharsis that is both exhilarating to read and uncomfortable to feel so exhilarated about. It’s a powerful reclamation of the racist narrative that Lovecraft created nearly a century ago, and it’s more wonderful and more unsettling than anything Lovecraft could have thought up. It’s a viscerally effecting and definitive illustration of the ways in which Lovecraft’s own biases and neuroses hindered him from telling this story in the way it deserves to be told. Victor LaValle has rehabilitated it and made it perfectly his own.